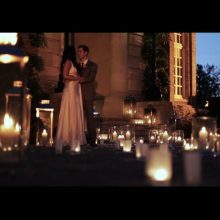 We have really fond memories of filming at Pembroke Lodge, as the last wedding video we filmed there was Emma & Jonathan’s – still one of our favourite videos to date. Selen and Ross’ wedding added to our love for Pembroke Lodge weddings. The video starts with a section of what was a classic best man’s speech, and concludes with a snippet from Ross’ speech. I love how Ben has edited this video, particularly how the time lapse of the sunset over Richmond Park fades into the fireworks display. There are so many little things about this wedding that I love, the bridesmaids signing the sole of Selen’s shoe, the little birds on the beautiful table names, the ivy draped round the windows, the origami towels on the hotel bed! “OMG Ben this is amazing!!! I was in tears on the street! Best early Xmas present ever thank you sooo much we both love it! Have a great Xmas with your family!